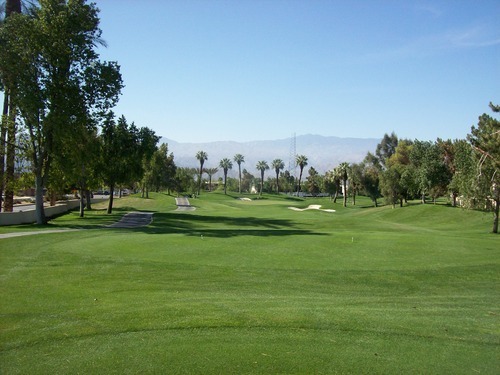 After battling the wind in Indio on Friday (which howled violently all through the night where I was staying in Indio), Saturday offered a change of pace. When I left my hotel early in the morning, the wind was still blowing very hard. 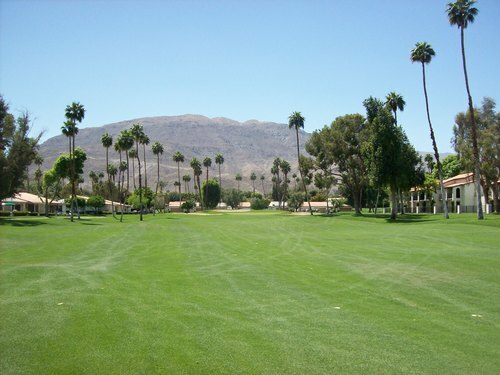 But it never ceases to amaze me how different it can be in different parts of the Coachella Valley. As I scoured the web for deals all week, there were many great prices in the afternoon on Saturday, but the morning options were more limited. That’s no big surprise, but Desert Springs was my best option. It was a little more than I was hoping to spend at $70, but the time (6:52) was ideal and it was a pretty decent discount compared to their normal rack rates right now ($160 on their site). 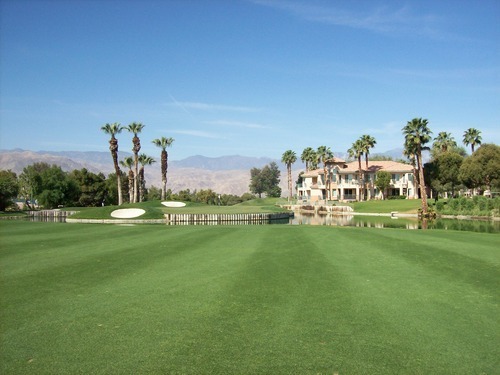 There are two courses at this resort (Palm and Valley), both designed by Ted Robinson. 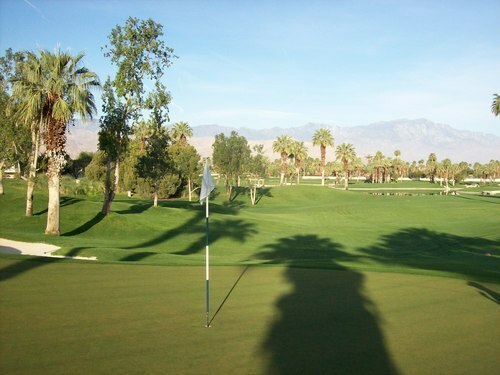 I played the Valley. 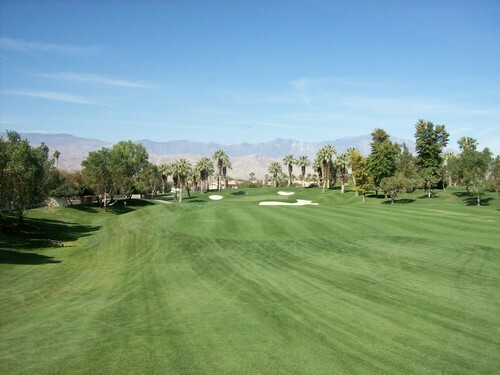 The latest review on Greenskeeper.org just a couple of weeks ago talked about how immaculate this course was, so I was looking forward to seeing it for myself. Well, it lived up to that hype from tee to green. 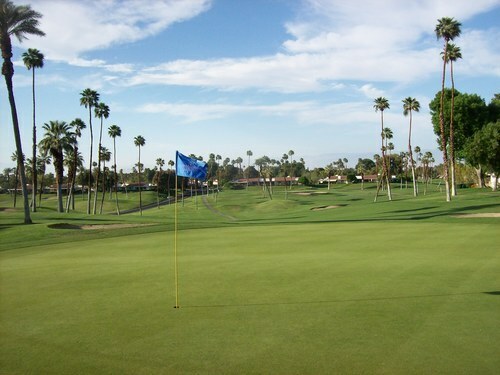 It was gorgeous with the tee boxes, fairways, rough and sand traps all in pristine condition. The conditions were simply awesome. 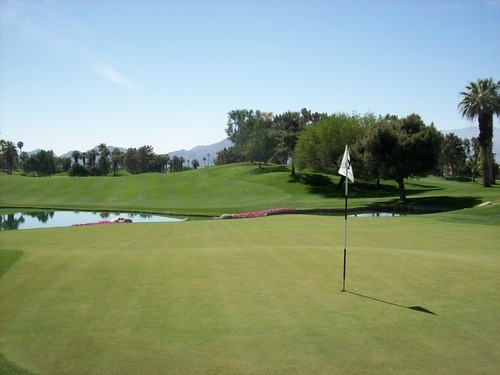 The greens weren’t quite as immaculate, but they were still nice. Both courses here recently underwent extensive multi-million dollar renovations and it’s clear any improvements they made paid off. 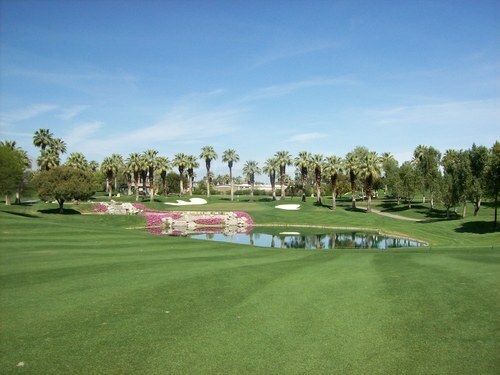 I’m not always a huge fan of Robinson courses, but I liked the Valley course a lot. 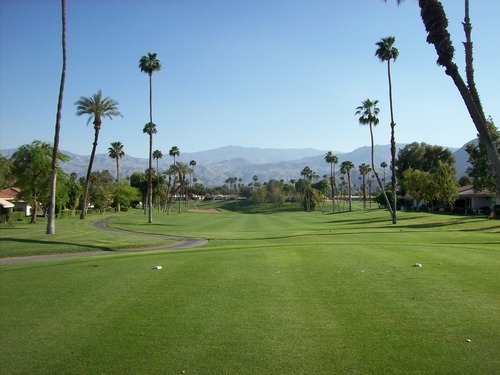 It works very well as a resort course. 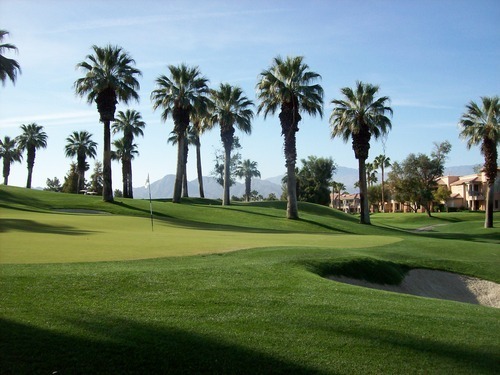 It offers something for more casual guests who simply want to enjoy a relaxing round on a beautiful course, while at the same time offers enough challenge and risk/reward options for those serious golfers who want to test their skills. 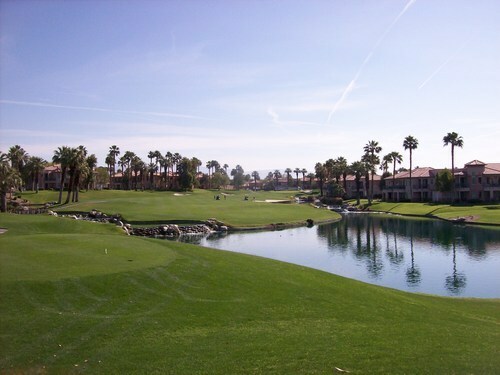 The course winds its way through the resort. 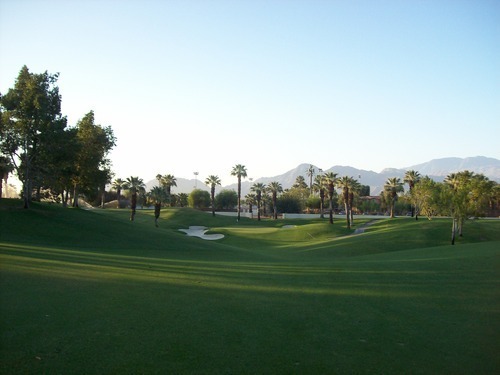 Though there are no major elevation shifts, there is plenty of natural undulation used in the layout making for very few flat lies on the entire course. None of the doglegs are too severe, but the bumps and humps of the fairways do enough to keep things interesting. 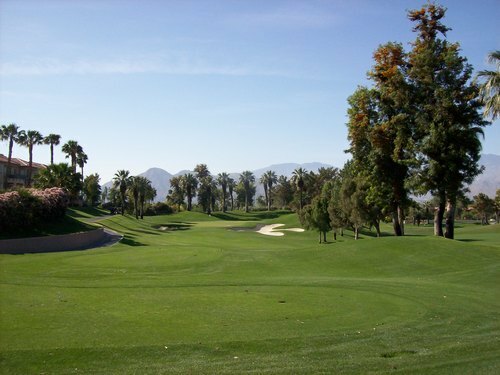 The fairways of the Valley course are very wide and forgiving, but once you get into the rough and into the tree lines, it can punish you. 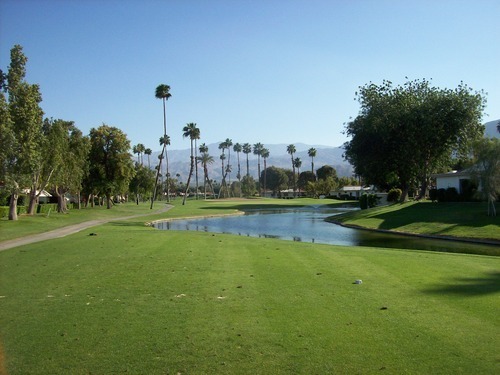 There is a lot of water on the course, which adds to the scenic quality of the landscaping. It is also what brings a number of good risk/reward options. 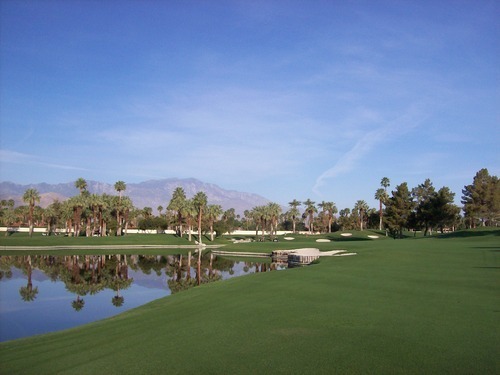 Most holes with water provide plenty of bail-out room if you want to play it safe and take the water out of play. 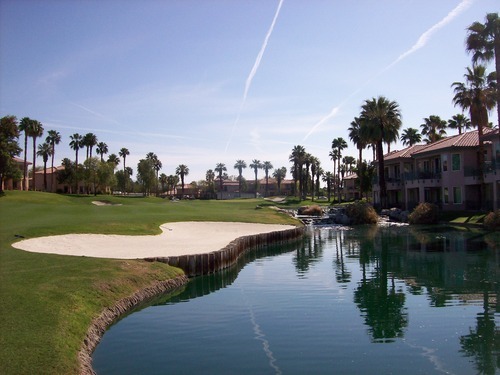 However, if you want to be aggressive, water hazards are well-placed to make you earn any birdies you get. 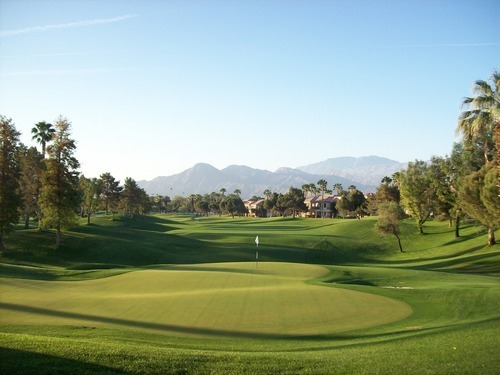 The greens are fairly big and well-protected, and as is typical with Robinson designs, feature plenty of undulation and distinct “shelves.” On his courses, you generally have to play the natural slopes and do what you can to be on the right level if you want to score well. 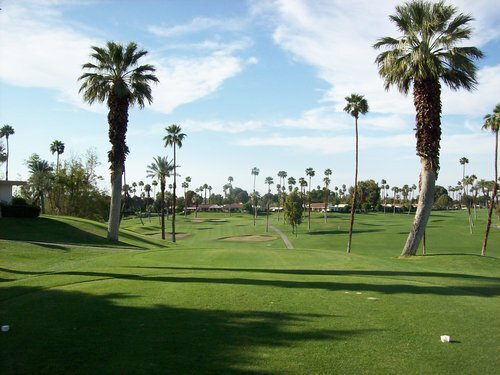 At times, this course reminded me of Tustin Ranch in Orange County with the design elements and placement of palm trees around the greens—just a much nicer version of it with better desert scenery and truly pristine conditioning. Even though the price was more than I wanted to pay, this course was worth it. The rack rates are obviously inflated this time of year, but deals can be found online and it’s worth checking out while in such great shape. 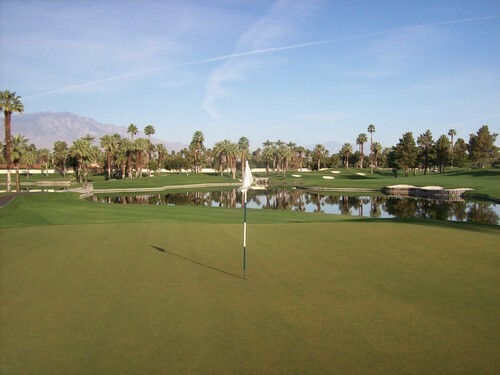 I look forward to coming back and playing the Palm course sometime soon. 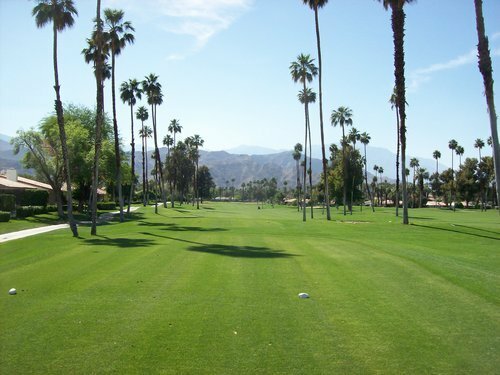 If you like palm trees, have I got a course for you! 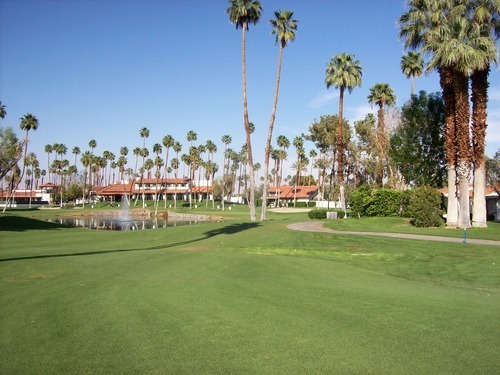 More on that point later, but it is something I’ll remember most about Rancho Las Palmas. 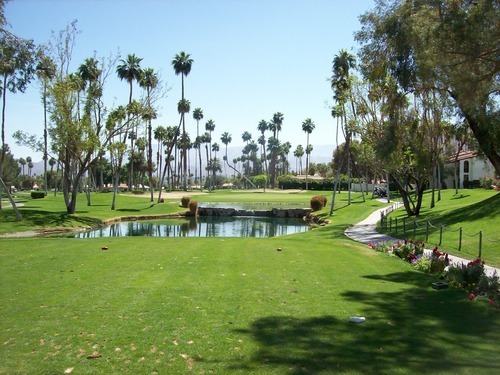 I had a 12:08 tee time for the West/South combo of this 27-hole complex. 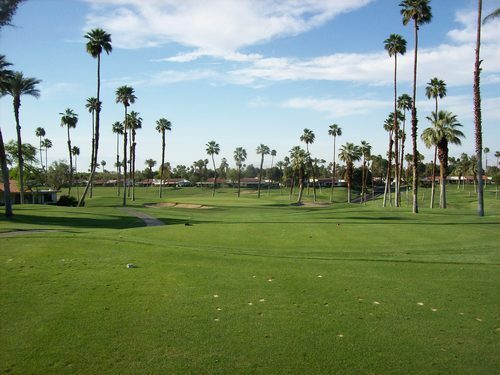 I bought my time through GolfNow for $59, which was a great price considering that the deal was for unlimited play. That was ideal for me because I wanted to at least play all three nines here. And that’s exactly what I did. 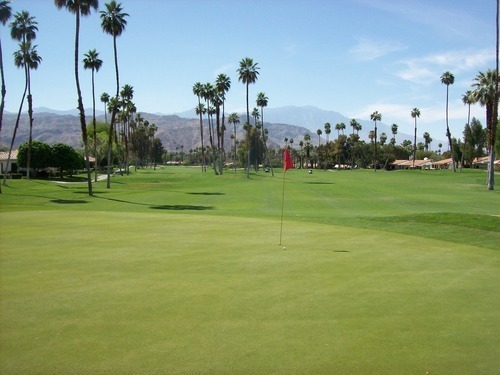 I had a little time to kill before teeing off, so I grabbed a hot dog from the snack shack and hit a few practice putts. 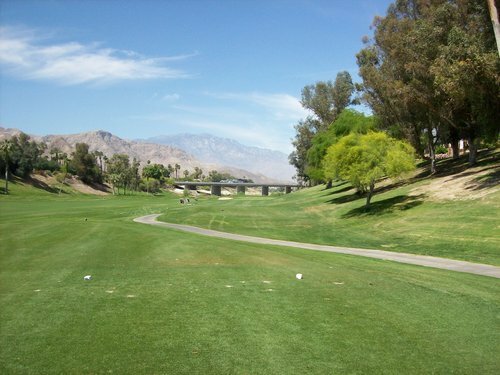 I was paired with a twosome—two very attractive young Japanese law students down from Berkeley who had never experienced Palm Springs style golf before—and we had a lot of fun in what was a very relaxing afternoon round. The pace was slow at times, but overall steady at just over four hours. After finishing the first 18, I went off by myself to play the North nine and I breezed through that quickly only playing through one group. 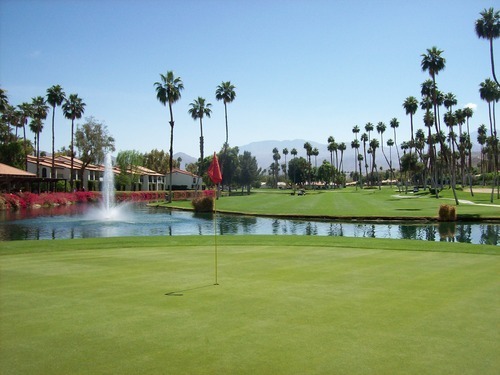 I could have played at least nine more holes if I really wanted to maximize my unlimited play deal, but I was satisfied enough after playing all 27 holes at Rancho Las Palmas. 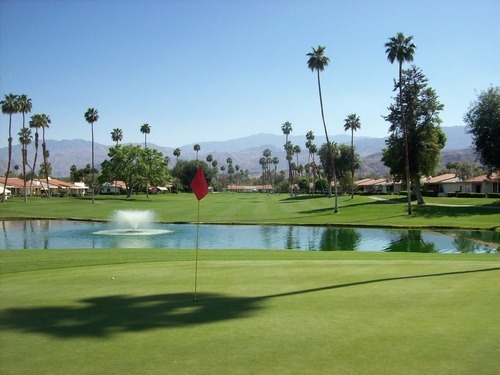 The Rancho Las Palmas courses wind through the resort and some residential areas, as well as down into the big gully (the “wash”) that runs through the area. 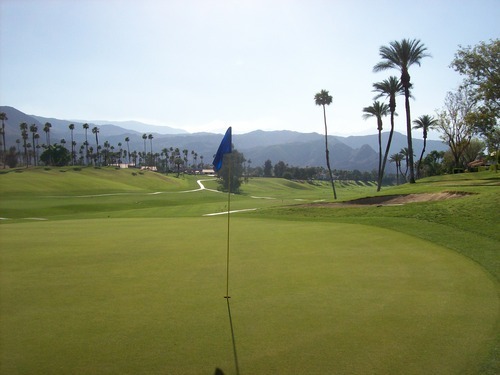 The first few holes of the West nine take you right down into it, but I found those holes to be the most boring ones. They are long, which provides the challenge, but very wide open without much excitement to offer. 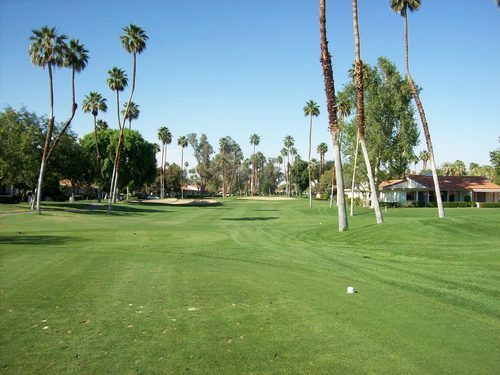 I think the 3rd hole here is the ultimate “grip it and rip it” hole because there is virtually no trouble to get into and you need a long drive to bite off as much as you can. 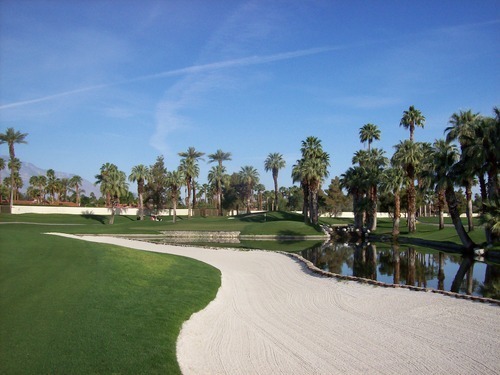 The South course has a couple of holes that utilize the wash, but in a more fun way with holes that go down and back up. 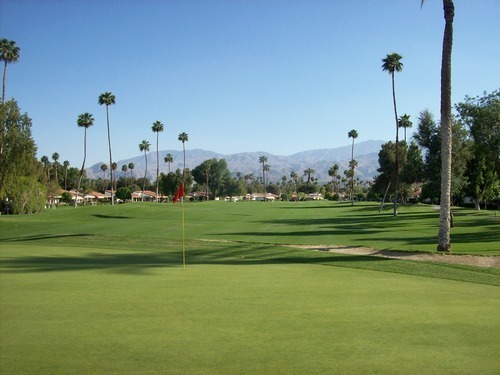 The North uses it the most with several fun holes that dip into and out of it. 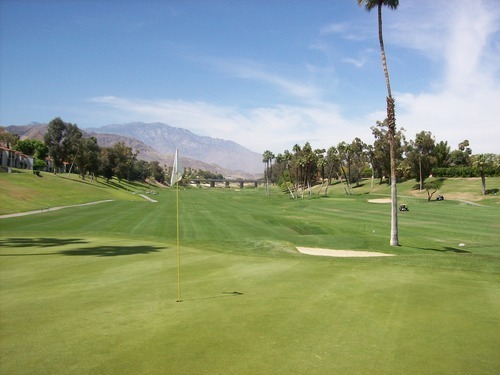 Most of the fairways here are pretty wide and forgiving, but there are some tight spots near the tees and around a few of the greens. 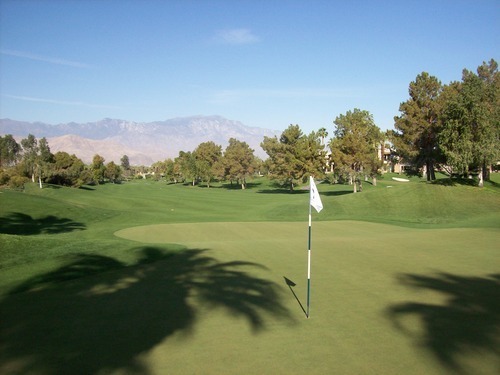 The greens are very small and don’t have much undulation, but can still be tricky to read because of the “Indio break” that only seems to have an impact when you don’t want it to. 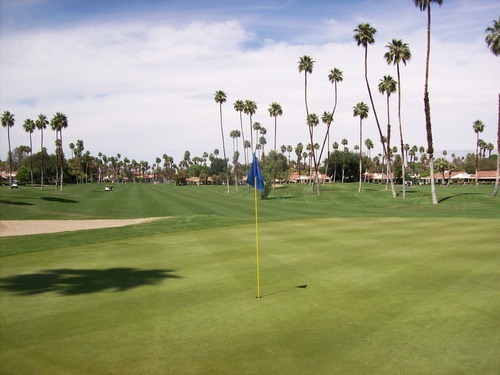 As hinted at earlier, what stands out most about Rancho Las Palmas is the amount of palm trees on the course. 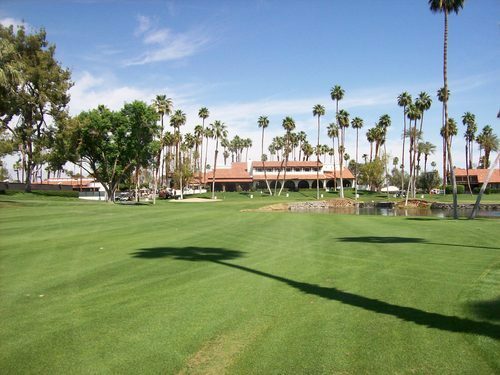 Now, there are palm trees everywhere you go in the Coachella Valley. 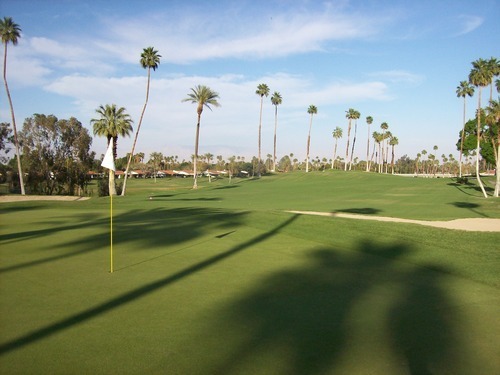 It’s a big part of the desert “oasis” lifestyle there, but I don’t think I’ve ever seen as many palm trees on one golf course as there are at Rancho Las Palmas. Most are the super tall skinny kind, but there are some of the shorter/thicker ones here, as well. 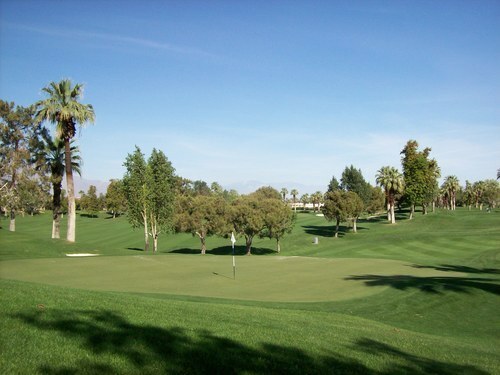 Most are just for decoration lining the fairways and surrounding the greens, but several will come into play. 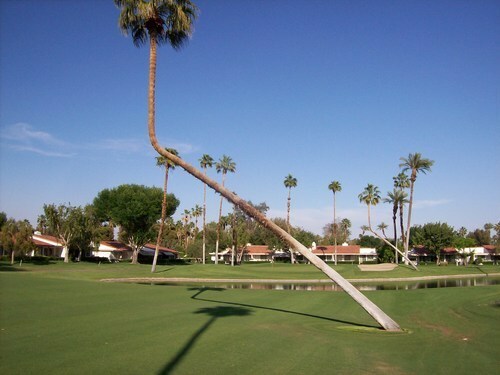 The 9th hole on the South course has some that will really get in your way and another hole that stood out was the 3rd hole on North, which has an unusual bent tree that leans over and provides a little visual intimidation on your approach shot. 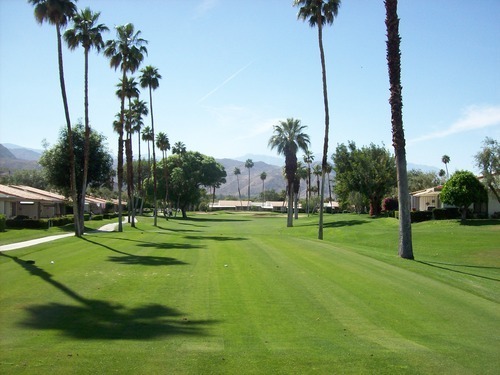 However, keep in mind that these are very narrow trees, so they are easy to get around. It’s still neat how they frame so much of the course, though. 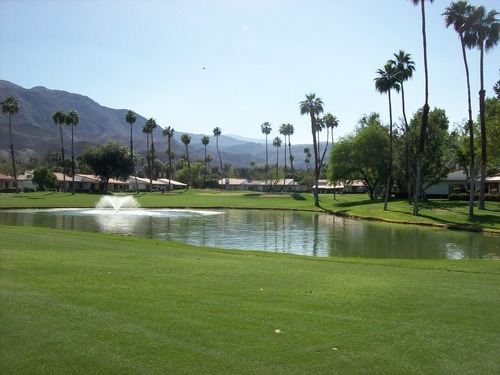 Another interesting aspect of Rancho Las Palmas is how it goes right up along some busy resort areas. 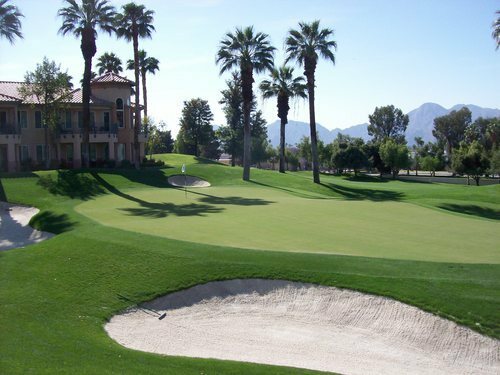 The 5th and 6th holes of the West course go right next to the restaurant and the pool area, where there’s a bit of a party atmosphere. It’s kind of different for a golf course, but those holes were definitely fun with plenty of onlookers. Conditions here were pretty nice overall. 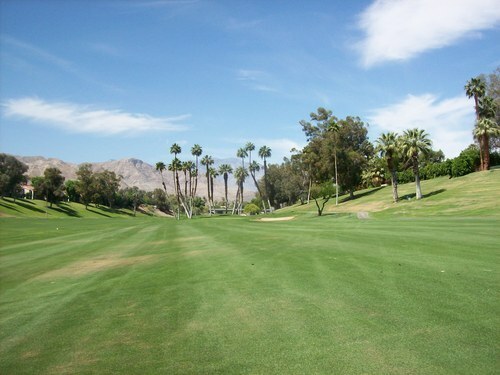 The fairways were mostly lush and green with some brown/thin patches scattered throughout. 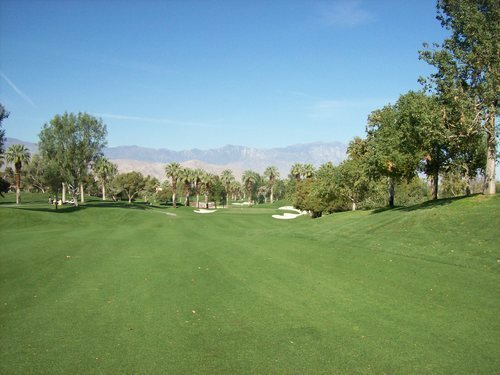 The worst areas seemed to be the fairways down in the wash, but that’s just being a little nit-picky. The tee boxes and rough were very nice and the bunkers had good sand. 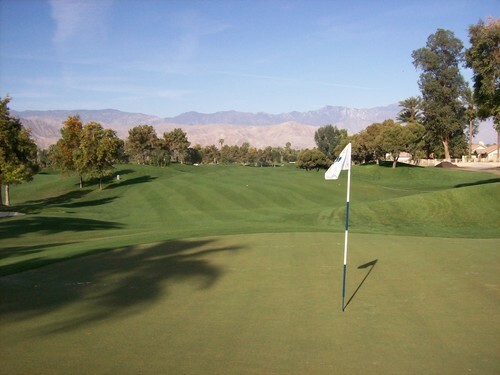 The greens were in solid shape. 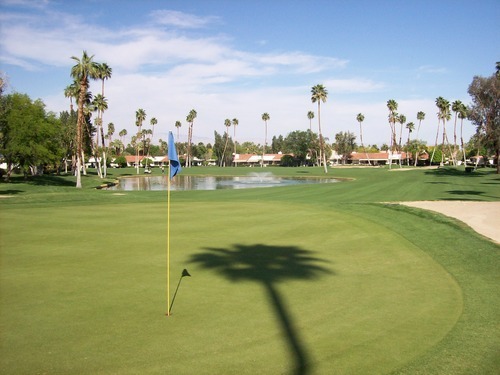 Though not “perfect,” the greens at Rancho Las Palmas were definitely the best of the three courses I played this weekend. 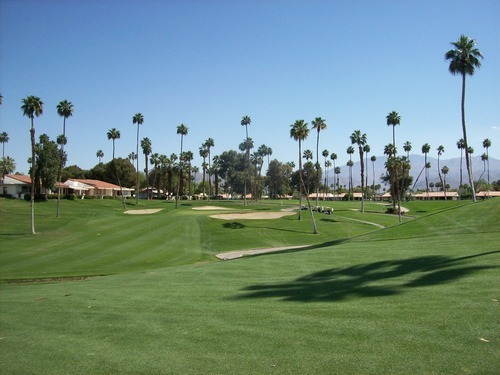 If I were to play here again, I would probably opt for the South/North combo, but all have some enjoyable holes. 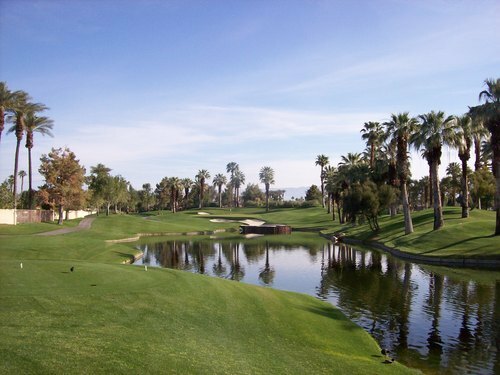 I thought the first half of the West nine was a little boring, though it does perk up a lot with those signature 5th/6th holes near the resort and the 9th is a great closing hole, as well. 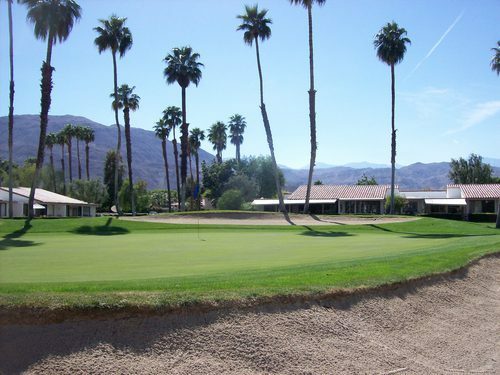 There are plenty of other Coachella Valley courses I’d still pick over Rancho Las Palmas, but you tend to get spoiled the more you play out there. But for the right price (many of their GolfNow times seem to be unlimited, as well) it’s a nice mid-range option that’s definitely worth considering.